I saved this tweet from Jodcaster Jennifer Gupta because it made me feel good. Sometimes it’s easy to understand WHAT and instrument and WHY it does it, but the HOW can be completely incomprehensible (more so to me than Ms. Gupta, I suspect). The Large Area Telescope (LAT) to which this tweet refers is the primary instrument on the Fermi Gamma Ray Space Telescope spacecraft. * As the name of the satellite suggests, the Fermi instruments are directed toward detecting gamma radiation sources. Gamma radiation (aka gamma rays) is electromagnetic radiation with a high frequency/short wavelength. In fact, gamma rays are the highest-energy forms of light in the electromagnetic spectrum. The Fermi satellite follows decades of gamma ray detection and analysis through various means by NASA, but it is unique in that it’s the first instrument to survey the entire sky every day for gamma radiation. The entire sky? Yes, but in search of some more specific targets: blazars, active galaxies, gamma-ray bursts, neutron stars, cosmic rays, supernova remnants, our own galaxy and solar system, and….wait for it….dark matter! The LAT is used to detect gamma rays using a process called “pair production,” which is governed by Einstein’s statement of the equivalence of energy and matter (E=mc2). Gamma rays are pure energy. When gamma radiation hits the tungsten detector in the Large Area Telescope, it creates a pair of subatomic particles, one electron and one positron. Silicon tracking detectors project the path of these particles backward to the source of the gamma ray. A third detector, the calorimeter, measures the energy of the particles, which is dependent on the energy of the gamma ray. The LAT is at least 30 times more sensitive than any other instrument sent into space for measuring gamma rays, so it’s no wonder that the results have been so phenomenal. Although the write-ups of the results aren’t directed toward a popular audience (you can read some of the recent publications at arXiv.org), occasionally the science team finds something so unusual it makes the daily news report. For instance, earlier this year, the LAT detected two gamma-ray flares in the Crab Nebula. I loved the press release for that discovery, which noted the science team was “dumbfounded” by the high-energy flares. Can’t you see a room full of post-docs in ratty t-shirts and jeans staring at their computer screens, saying, “WTF? I seriously need to get more sleep!”? If you want to delve into the Fermi spacecraft in more detail without battling through a course in particle physics first, NASA has a fantastic guide on the subject for science writers. It’s almost 50 pages long, but so interesting, I have to recommend it for reading at dinner table. *The spacecraft was originally named the Gamma-Ray Large Area Space Telescope (GLAST), but was renamed for Enrico Fermi in August 2008. 1) We’re looking at the underside of a triangular “platform” that weighs some 900 tons. The platform is suspended on 18 steel cables. Six more cables connect the corners (two at each corner) to jacks used to adjust height of platform (millimeter by millimeter). 2) The circular structure on the underside of the triangular platform is the track on which the 328-foot azimuth arm rotates. 3) The azimuth arm (the bowed trusswork) is another track system. The carriage house travels on one end of the track, the Gregorian dome travels on the opposite end. 4) The carriage house serves as the terminus for various linear antennae tuned to a narrow band of frequencies. The antennae are directed downward, toward a massive reflector dish. 5) The Gregorian dome is a complicated beast but it essentially enables the spherical reflector of the telescope to behave as if it was a parabolic reflector (the most common shape used for radio telescopes). 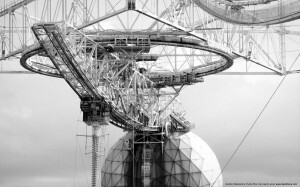 That odd hanging half-dome contains a multi-beam receiver that can look at seven reflected beams at simultaneously (as opposed to a single-signal linear antenna). The second reason that observatory caught my eye is that it was designed to take advantage of the geological formations of the site. That huge dish is built on a natural karst (again, the construction photos tell a good story). It’s good to know karst land is good for something other than swallowing holes, collapsing mines, and breaking legs. In recent years, the telescope has been scrambling for funding, but the NSF has decided to fund it through at least 2016. That gives me five years to figure out a way to go see this place in person. We’ve been having a lot of discussions about neutrinos in our house lately, mostly because I’m forcing my partner to read F. E. Close’s Neutrino. Neutrinos are elementary particles that are emitted with neutrons transform into protons during certain types of nuclear reactions or radioactive decay. They are electrically neutral, meaning they have no electrical charge, negative or positive, and don’t react to electromagnetic forces. They can travel through matter for great distances without being affected by the properties of that matter. This means that once they have been produced/released as part of a cataclysmic event, neutrinos can travel the cosmos without being absorbed by matter or disturbed by electromagnetic forces. In theory, this means that they travel across the entire cosmos to arrive at earth without having significantly changed since the moment of origin. Some of the neutrinos at large in the universe are “man made,” in that they were produced at nuclear power stations, in particle accelerators, by nuclear bombs, and some were generated naturally, during the birth-to-death cycle of stars, for example. Majority opinion in the astronomy world supports the claim that most neutrinos were created about 15 billion years ago, just after the birth of the universe. The universe has been cooling and expanding for 15 billion years, yet the neutrinos are still hanging with us, unchanged, as cosmic background radiation. Since neutrinos don’t change with time or distance, their current constitution should reflect their origin. That is, extremely high-energy neutrinos should be connected to high-energy origins (supernovae, gamma ray bursts, black holes). If we suddenly detect a huge number of neutrinos hitting our instruments, we can bet they were associated with a major event. For example, the day before the core collapse supernova in the Large Magellanic Cloud was detected in 1987, astronomers noticed an usually high number of neutrinos hitting their detectors. The neutrinos were emitted before the explosion, while the collapse was in process, so their arrival was actually a warning to astronomers, telling them a) that something big is happening; and b) what direction to look to find that big happening. A great early warning system! Trouble is, since neutrinos don’t really interact with anything, they’re hard to detect. To observe them in sufficient number, you need an immense instrument. For instance, the main collector of IceCube, the neutrino detector at the South Pole, consists of an array of 5,160 detectors frozen in one cubic kilometer of ice. 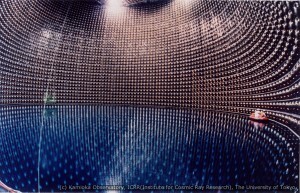 The image above is the Super-Kamiokande neutrino detector in Hida City, Gifu, Japan. The Super-K detector, associated with the Kamioka Observatory, was constructed one kilometer underground in the Kamioka mine. The detector consists of a stainless steel tank (bottom half of the image, with life raft! ), 39 meters in diameter and 42 meters in height, filled with 50,000 tons of ultra pure water. When the neutrino hits the water, its interaction with the electrons or nuclei of water can produce a charged particle. That charged particle (“Cherenkov light”) moves faster than the speed of light through the water. It’s measured by some 11,000 photomultiplier tubes on the superstructure of the detector (top half of the image) as it moves, and is analyzed to determine the incoming direction and type of neutrino that hit the water. Okay, technically, the linked images aren’t sized for wallpaper, but they are high-res, so quite adaptable. The instrument was refurbished in 2005-2006 and those images are available for scrutiny as well. There are very few truly public observatories in the U.S. Most are owned by universities or research institutes (so, quasi-public), or are managed and operated by a complex public/state/private cooperative effort (take Mount Wilson, for instance: it’s run by the Mount Wilson Institute under an agreement with the Carnegie Institution in Washington, but the observatory sits on USDA Forest Service land, so it has to operate according to federal guidelines). 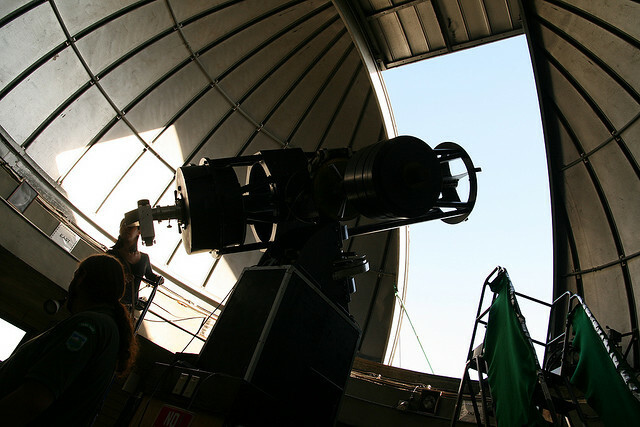 A lot of these observatories have public programs so visitors can experience basic observational astronomy and learn about historical or current R&D, but for the most part, the observatories are reserved for institutional use. So, we were excited when we learned that one of the few observatories in Washington state was designed from its outset as a “as public as we can get” space. The Goldendale Observatory State Park owes its existence to a group of four men, M.W. McConnell, John Marshall, Don Conner and O.W. VanderVelden, who built a 24.5 inch Cassegrain reflector telescope together. They donated the scope to the city of Goldendale, and the city obtained federal funds to build the observatory in 1973. From 1973 to 1980, the observatory was managed by a non-profit organization, and in 1981, the Washington State Parks Commission took over responsibility. 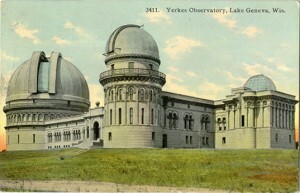 (Don Hardin has written up a much more extensive history of the observatory.) So, now it’s a State Park, which is something neat and unusual. At least, we found the whole thing exciting. We timed our visit to coincide with the August Perseid meteor shower and joined a group of enthusiastic viewers for some naked-eye skywatching for a large portion of the night. The evening public viewing program was fun, although someone did take a spill off the stairs leading up to the eyepiece of the 24.5 inch telescope. We saw all the usual suspects (globular cluster, binary star, etc.) and considered our evening well spent. The BEST part of the Goldendale experience, however, is the daytime viewing. Not many public programs run during the day, which is a shame, because the sunspot viewing was fantastic. Then, too, looking through a telescope at Mercury on a sunny afternoon is its own kind of awesome. 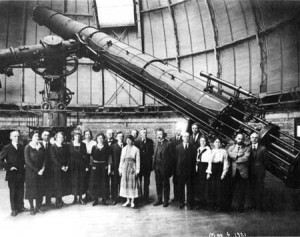 24.5" Cassegrain at Goldendale Observatory. Photo courtesy of Bernt Rostad. I love it when New Zealand and Australia get together to do things, as they always come up with great ANZ+ words. Take for instance, anzSKA, the Australian and New Zealand component of the Square Kilometre Array, a collaborative effort in radio astronomy. The SKA project is immense in terms of territory and stated goals. Some twenty countries will be participating in the development of antennae, fiber networks, signal processing, and computing. The SKA will use 3,000 dish antennae, each about 15 m in diameter. The antennae will be distributed in five spiral arms extending at least 3,000 km from the center of the array. Last month, SKA announced that the Project Office will be at the Jodrell Bank Observatory near Manchester, UK, beginning January 2012. The actual SKA array will be built either in Southern Africa or in Australia-New Zealand, knocking China and a joint Argentina-Brazilian proposal off the long list. The final site choice is scheduled to be named next year. So, today’s wallpaper is an image of a former Telecom New Zealand dish. Located north of Auckland, it previously was used for telephone, television, and broadband communications. In November 2010, Auckland University of Technology acquired the dish and set to repurposing it as the country’s largest radio telescope antenna. 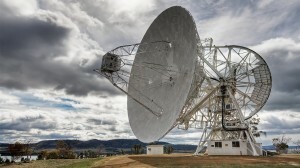 In addition to promoting more opportunities for research in practical radio astronomy, the dish is seen as a tool for enhancing New Zealand’s chances to co-host the SKA with Australia. Reflecting telescopes use mirrors to gather light. A large concave mirror (the “objective” mirror) collects the light as it enters the tube of the telescope. It then reflects the collected light onto a smaller mirror, which in turn reflects it into the eyepiece for magnification. Refracting telescopes use convex lenses to gather light. The lenses refract (bend) the light to bring it into focus. The lens is thicker in the center than it is at its edges. This means that the light bends more at the edges, sending to toward a central focus point. The point of focus is where the image is created. The Yerkes 40-inch refractor is the largest refracting telescope in the world. Cassegrains are reflectors. The classic Cassegrain has a parabolic (concave) primary mirror and a hyperbolic (convex) secondary mirror. As you can see from the diagram below, the mirrors are aligned with the focal point behind the primary mirror (outside the telescope tube, at the end of the tube). The light is gathered through the open end of the tube on the left and bounced off the primary mirror onto the secondary mirror. The secondary mirror then bounces the light to the central focal point, through a hole in the primary mirror at the right. After some searching, I found the original description of the Cassegrain telescope in the 29 February 1672 issue of the Journal des Sçavans. * Here’s the .pdf, Cassegrain Telescope, 1672 Journal of Sçavans, courtesy of Gallica Bibliothèque Numérique.